Of the hodgepodge of millennial acronyms and puns that I’ve picked up on social media over the years, Fri-Yay might be my favorite of all. HAPPY FRI-YAY everyone! 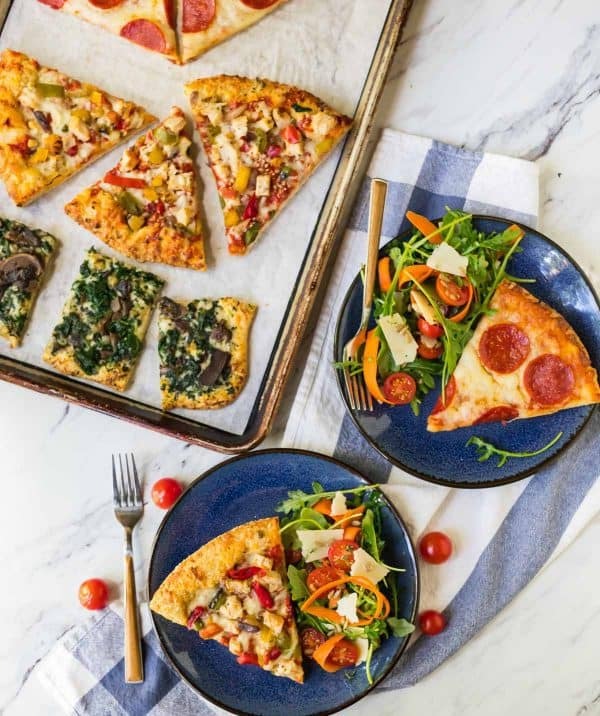 Let’s keep it easy with a simple, delish pizza dinner and a quick, healthy side like this Anytime Arugula Salad. This colorful blend of peppery arugula, juicy cherry tomatoes, and colorful carrot ribbons (plus giant shavings of Parmesan because it’s a YAY kind of day) is flavorful enough to be worthy of the weekend, but easy enough so I never feel too tired to throw it together, even at the end of a long week when my heart is happy but my brain is saying hi, I’m done. This salad recipe is flexible, fast, and makes me feel both wholesome and creative at the same time. It’s the sort of salad I wish I could order at every restaurant: veggie packed and crisp, with a vibrant lemon balsamic dressing that enhances the flavors of the other ingredients without making the salad wet or soggy. I’ve made assorted versions of this salad dozens of times over the years. It’s a back-pocket kind of recipe that gives me a quick, tasty way to add some green to our plates, and I enjoy it every time I make it. It’s also an ideal pairing with one of my Freschetta Pizzas! Most recently, I served this salad when I had girlfriends over for an impromptu back porch happy hour that (as all good gatherings with gal pals and wine are apt to do) extended into dinner time. I headed into the kitchen to see what I could throw together for our hungry crew. I had a big bunch of arugula and a few miscellaneous veggies, so this Anytime Arugula Salad was a given. Side dish: done and done. For the main event, I reached for Freschetta Pizza, which Ben and I had tried for the first time a few weeks prior. You guys, it is SO GOOD. It’s easy to rail on frozen pizza, because (let’s be honest) a lot of it is bad. Not this one. 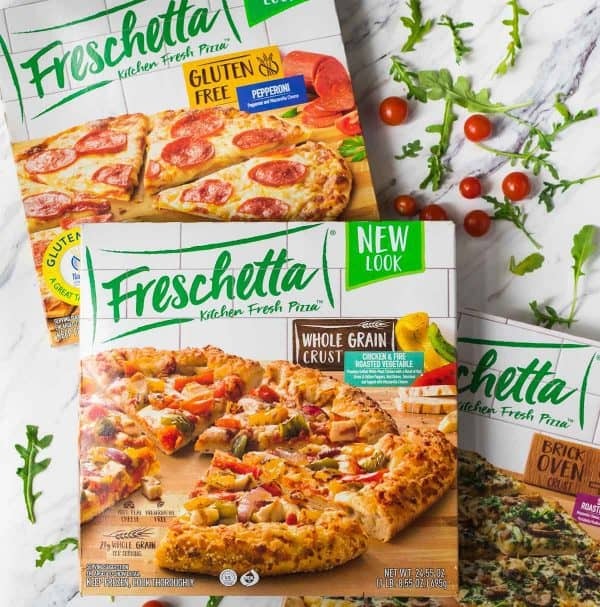 Freschetta is made from quality ingredients, including real-deal cheese and premium meats, and the crust is preservative free. The pizzas promising vegetables contain a lot of vegetables, not just a sad tomato tossed here or there. The chicken is moist and doesn’t taste processed. I’d purchased two pizzas, and after baking and inhaling the first, Ben expressly instructed me that I wasn’t allowed to eat the second, because he wanted it. Please, thank you, don’t touch my pizza. The Friday night my girlfriends were over, I baked us three different pizzas to try, and it was casual, fun, and perfect. I think #FreschettaFriday needs to be a thing from now on. Who’s in? In the amount of time it took the pizzas to cook, I was able to pull together this arugula salad. I added carrots and tomatoes because that was what was in my refrigerator. I also tossed in some sunflower seeds for texture and some chopped fresh herbs that were threatening to expire. 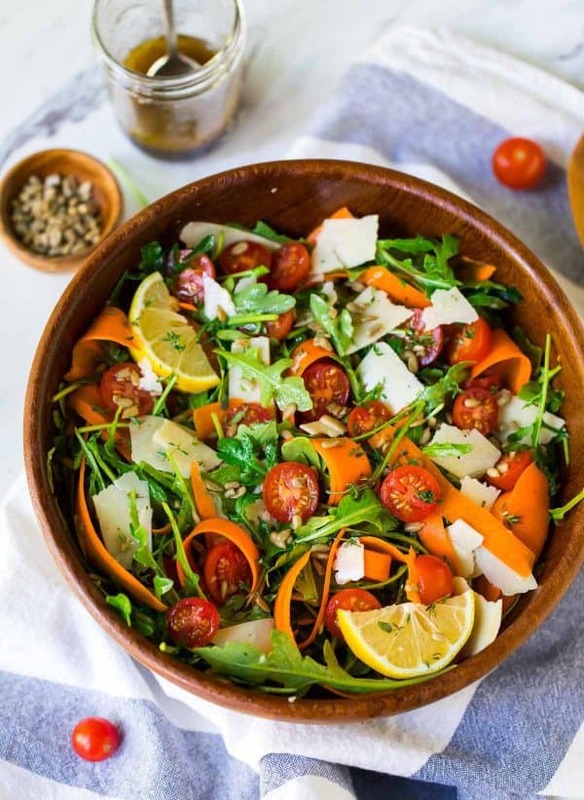 Honestly though, you can serve this salad with only the arugula, lemon balsamic dressing (which tastes completely dynamite with arugula), and Parmesan. The other ingredients are yummy, but it’s this simple trio that does the heavy lifting. Simple, perfect arugula salad with lemon balsamic dressing and Parmesan. Easy and flavorful! This healthy side goes with any meal and is ready in minutes. 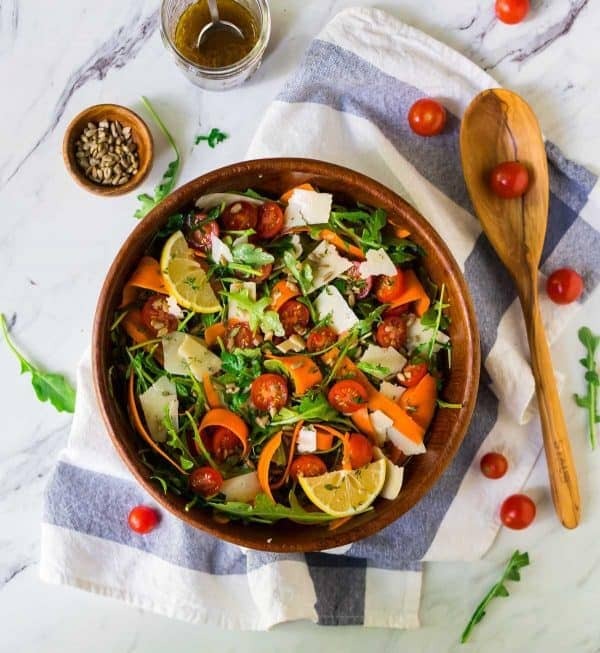 Place the arugula, carrots, and tomatoes in a large bowl. In a small bowl or large measuring cup, whisk together the dressing ingredients: lemon juice, balsamic vinegar, olive oil, and salt. (Alternatively, you can shake them all together in a mason jar with a tight-fitting lid). Drizzle enough over the arugula to moisten it, then toss to combine. Sprinkle Parmesan and any desired nuts or herbs over the top. Serve immediately with a drizzle of extra dressing as desired. I am sharing this post in partnership with Freschetta. As always, all opinions are my own. Thanks for supporting the brands and companies that make it possible for me to continue to create quality content for you! Our family makes frozen pizza a lot and I’ve been looking for a good quality brand. Going to need to try the whole wheat version, thank you! Patricia, I think you’ll love it!! Salad & Pizza is my fav dinner combo! Who doesn’t love a pizza night!? And what a gorgeous green salad to make the meal! 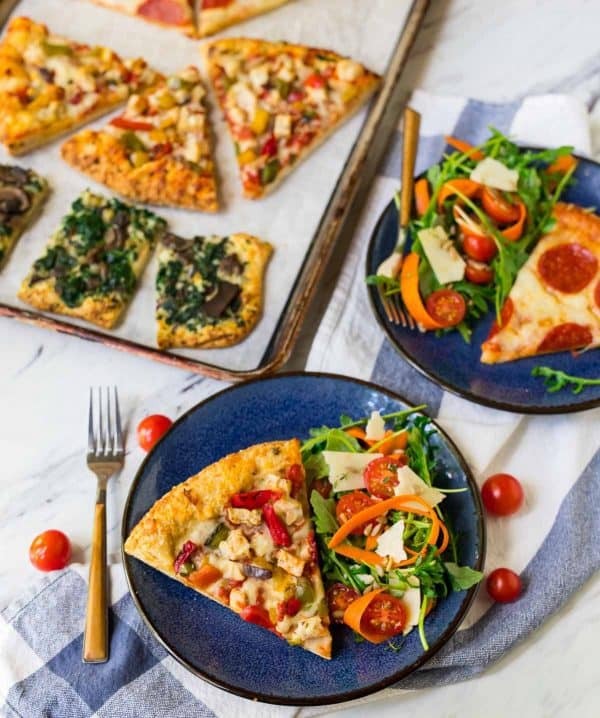 A big salad and pizza is the ultimate Fri-YAY food! Always welcome in my house. This looks absolutely scrumptious! 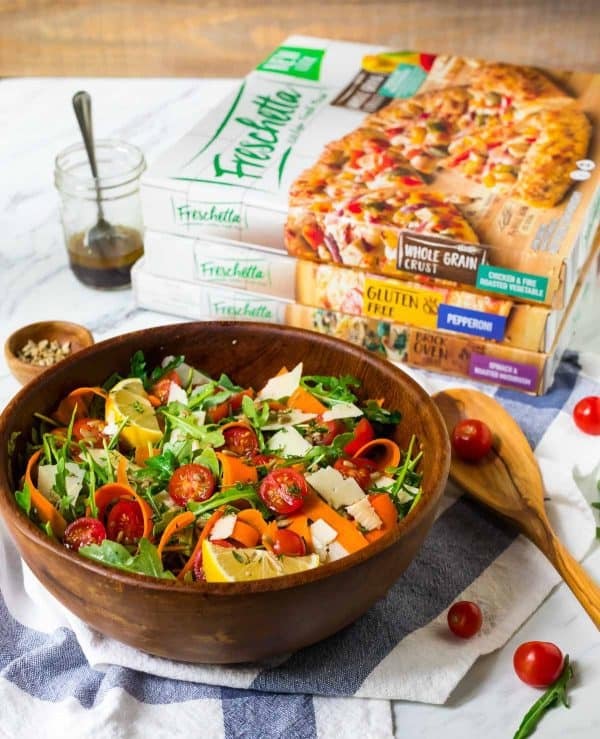 LOVIN’ this pizza & salad combo! What a gorgeous salad! Such a delicious side for gluten free pizza!